The pronunciation of French vowels can be difficult for students. This is a simplified summary to help you get started; for more detailed information, click any letter for the lesson with sound files or take a look at the main vowel lesson. What most people call vowels are more precisely known as "oral vowels" in French, to set them apart from nasal vowels. Here are the most common vowel sounds and combinations you need to master. A is pronounced more or less like the a in "father." AI is pronounced as in "bait." AU is pronounced like "oh." E is usually pronounced like oo in "good," unless it has an accent. EAU is pronounced like "oh." EU is pronounced like oo in "good." O may be pronounced like "oh" or like the o in "son." OU is pronounced like ou in "soup." U is a very tricky sound with no English equivalent – please click for the lesson and sound files. 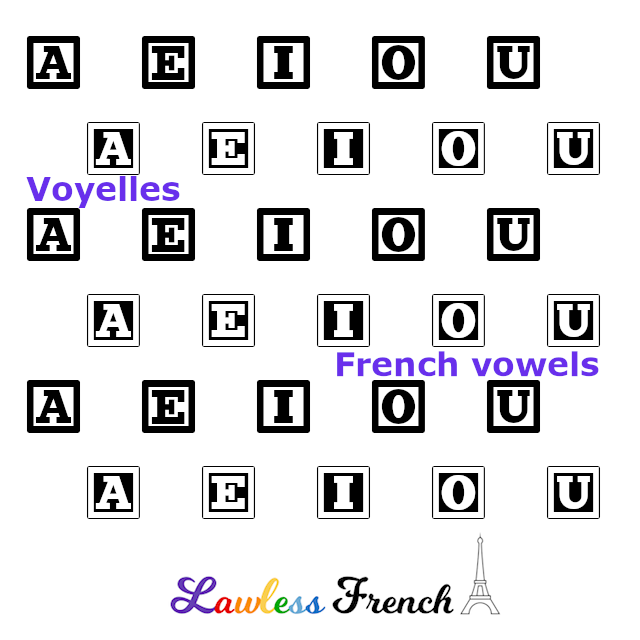 See the main vowel lesson for some general notes about French vs English vowels as well as more detailed information about French vowels in general.